The large monument in the center is the Military Monument. The one on your left is the Firefighters Monument. The one to your right is the Law Enforcement Officers Monument. The three monuments together will be known as Heroes Monument. Anyone can purchase a tile for a hero! Any active duty military personnel, veterans and deceased veterans from Lafourche Parish can have a tile on this monument. All discharges, with the exception of a dishonorable discharge, will be accepted. 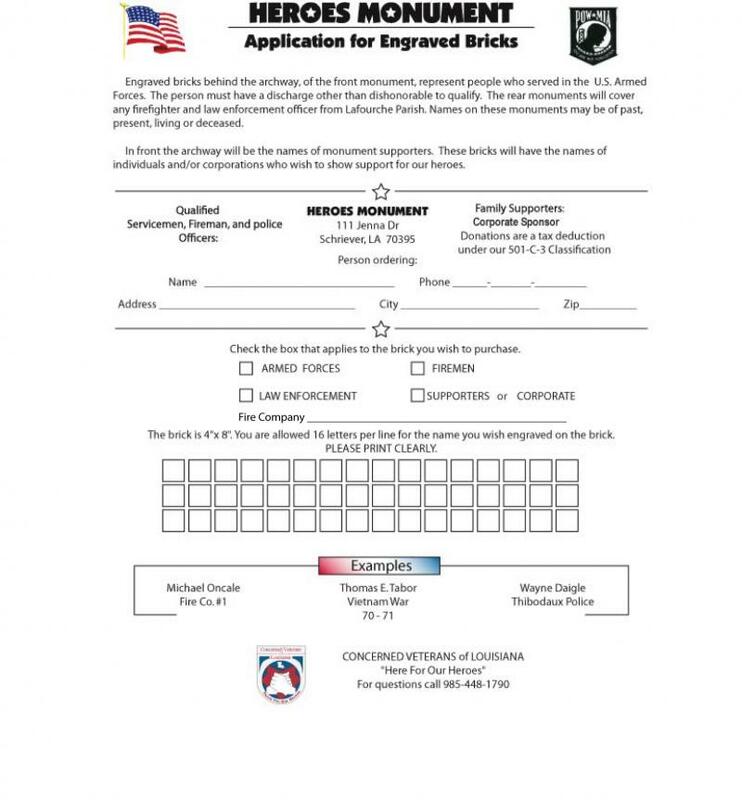 A Lafourche Parish firefighter must have five years of active service before a tile can be purchased. A retired fireman in good standing and a deceased fireman can both have a tile on this monument as well. Any person who is a certified law enforcement officer in Lafourche Parish, including its municipalities, can have a tile on this monument. Any La. State Trooper from Lafourche Parish can also have a tile on this monument. A hero who is classified as P.O.W. 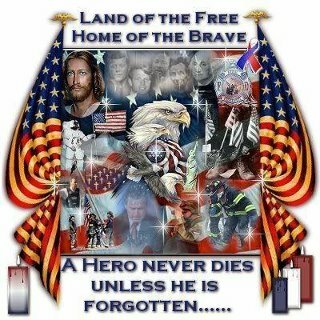 , M.I.A., K.I.A., Missing and Presumed Dead or Killed in The Line of Duty will be eleigible to have his/her name placed on the monument at NO COST to THE FAMILY. This is a Heroes Monument. Any name placed on this monument with false information will be removed. Each application must have the name of the person who will purchase the tile. 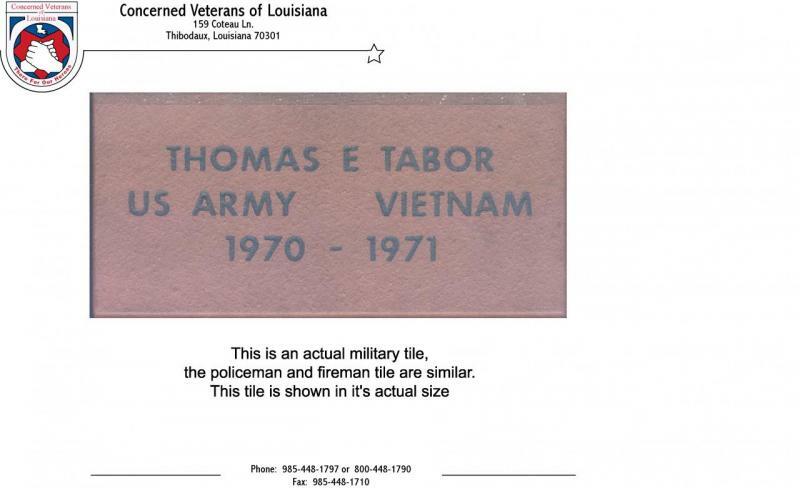 When it is proven that a name does not belong, Mr. Thomas Tabor will call the person who purchased the tile to witness to removal of said tile. 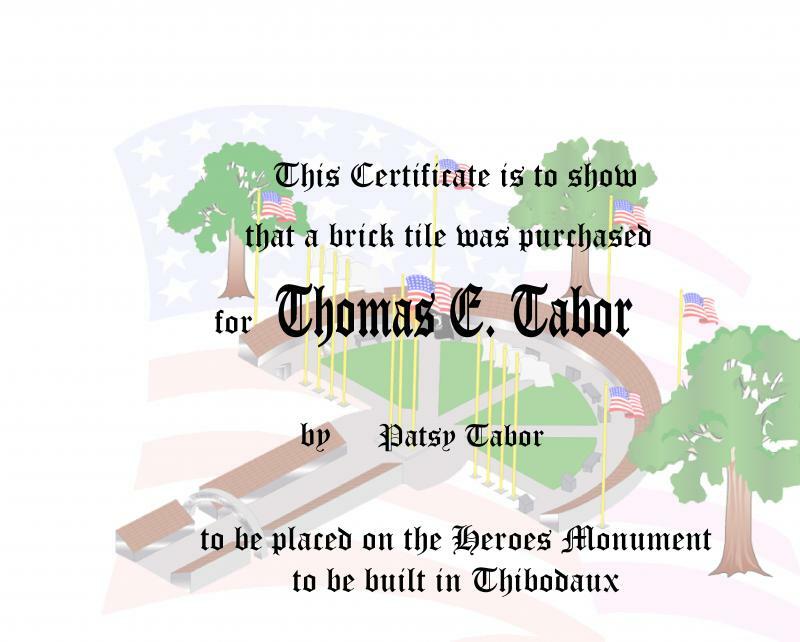 Anyone can purchase a tile before the archway to show support for Heroes Monument. You may put any text (with the exception of negative language) on these tiles. You do not have to be a family member or friend to show support, but it helps. Businesses or corporations can place a tile as well. We would like anyone and everyone to purchase a tile to honor these heroes for what they are doing -- or for what they did. The Archway will read, "FOR THOSE WHO FOUGHT FOR IT, FREEDOM HAS A FLAVOR THE PROTECTED WILL NEVER KNOW "
There will be NO, and we mean NO, politics or advertisements behind the archway. This is a picture of an actual tile you can purchase to place on the Heroes Monument, the same tile a supporter can buy to be placed before the Archway. You will get a certificate like the one above for buying a tile on HEROES Monument. 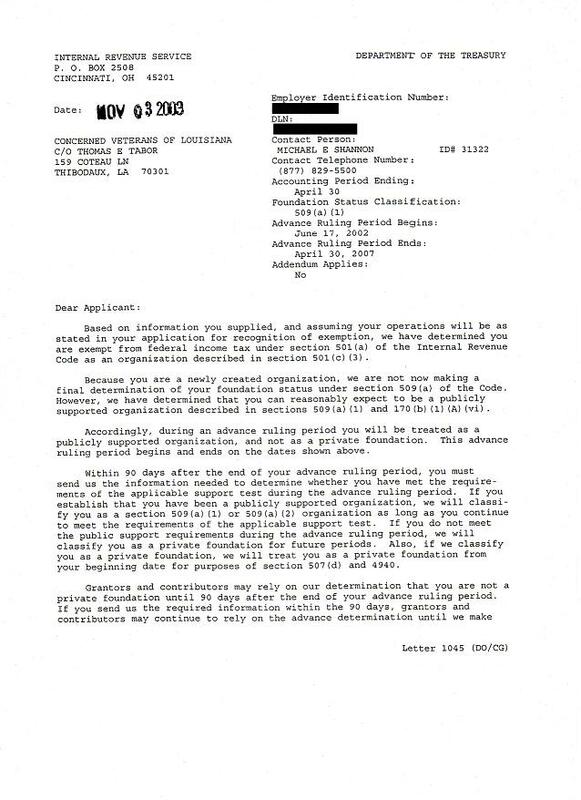 This is our 501 C-3. 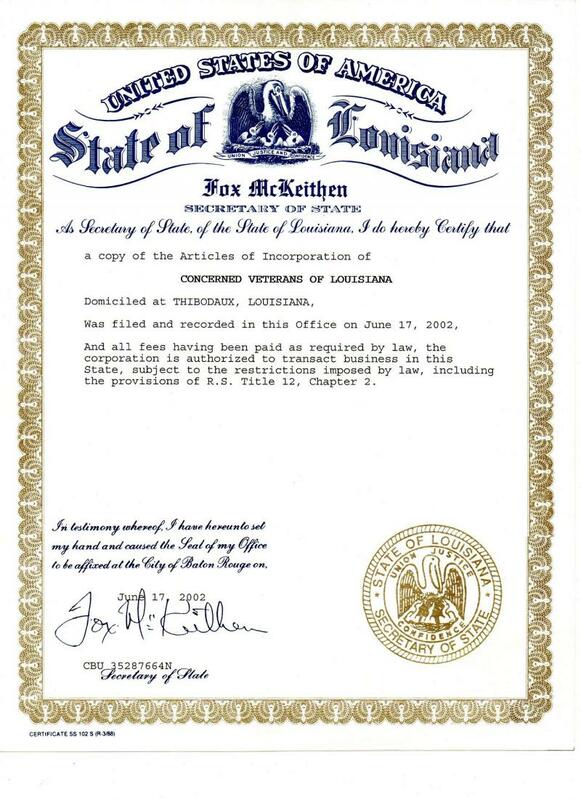 Concerned Veterans of Louisiana Inc. is for real! Our EIN# and DLN# have been blacked out for our protection. If you are serious about a donation, we will send you a copy via email, fax or U.S. Mail - your choice. This is our incorporation paper from the state of Louisiana. Be advised we are not accepting money for tiles at this time. We would like you to send in your information on our contact page so we can keep count of the people participating. Leave your phone number -- and when we begin to build, you will be notified of the price of the tiles. Donations and Supporters are welcomed at anytime. For those of you, who have purchased a tile, your tile is a done deal. The new application for tiles may cost a little more than you paid, but your tile is paid for and will be placed on Heroes Monument. Any questions, feel free to contact me on our contact page.